With the recent FedRAMP accreditation issued to Oracle’s Planning and Budgeting Cloud Service (PBCS), organizations that perform contract work for the federal government finally have the ability to prepare their Annual Operating Plans (AOP’s) inside a secure and convenient cloud environment. 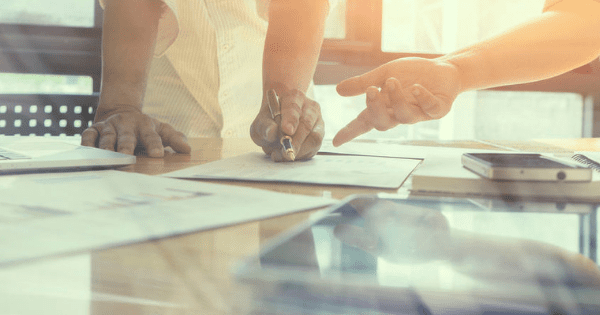 PBCS is the planning tool of choice for many Fortune 500 companies and brings the flexibility required for complex government contractor organization’s unique planning needs, specifically project planning and producing a fully-burdened P&L. Setting up PBCS with the ability to automate indirect cost allocations on projects can give users the added insight they need in their planning process, understand true project profitability, and help companies more effectively plan their indirect rates. We have configured PBCS, as well as the on-premises Hyperion Planning version applications, to achieve this level of automation and will walk through many of the industry-standard configurations that will allow a government contractor to get the most out of their investment in their planning and analysis tool. Unlike traditional budgeting processes, formulating an AOP doesn’t necessarily require planning at a detailed account level in a P&L. Companies can create a Project Summary Report (PSR) view of the P&L and capture revenue and costs tailored to the level of detail needed to view the profitability of a project. In the sample account hierarchy below, planning occurs at summarized revenue and cost buckets while still providing the appropriate breakout for calculating the correct reimbursable revenue and burdens on a project. After structuring the account hierarchy in the “PSR” view, the application can be configured to allocate costs to projects according to their appropriate pools. Each project within PBCS can have custom attributes assigned to them; in this case Subcontractor Material, Overhead, Business Development, and General and Administrative pool attributes. Project attributes can be referenced in business rules designed to calculate project burdens according to planned direct costs on the project and the pool attributes tagged to each project. 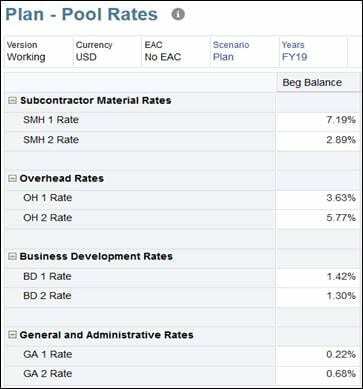 In a rate form, planners can input rates for each pool attribute assigned to projects. Below are rates entered for each pool attribute in their respective pools. If you look closely at the input form, you will notice that the rates are being entered to the “Working” version. If an organization wants the ability to plan for potential rate changes and how that rate change would affect a contract’s profitability, they can simply switch to a “What-if” version, enter different rates and allow the application to re-calculate the P&L without affecting the original Working version. It is also important to note that this type of flexibility can be granted all the way down to a PCA in charge of a project, or restricted to application administrators/power users. While the rates entered above would be used to calculate cost burdens, they also impact the amount of revenue reimbursed on a contract. This is convenient for contracts that have identical reimbursement rates, but what about contracts that stipulate a rate “cap” on reimbursed revenue? Leveraging the same PBCS attribute functionality as the burden rates, companies can plan for revenue rate caps on contracts. Rates entered on the below form override pool rates when calculating revenue and give planners the flexibility to plan contract specific revenue requirements. After all prerequisite setups and inputs are complete, users can begin a project’s AOP. 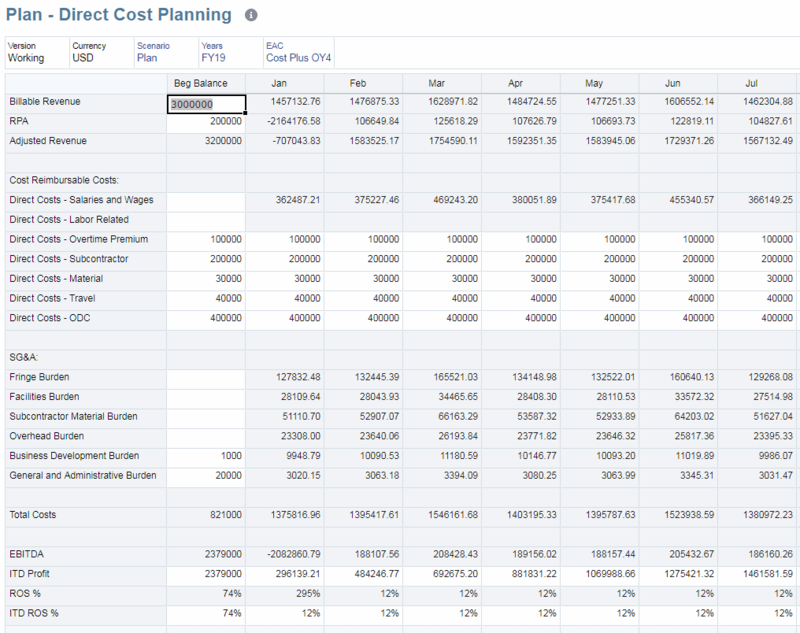 In the next sample form, direct costs are planned and accumulated on a project. After all project direct costs are entered, users can execute the project burden calculation and observe the output in the SG&A section of the form. 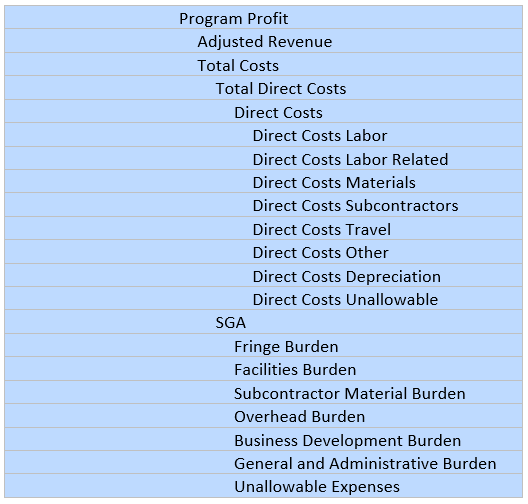 Please note that the Fringe and Facilities Burdens seen below are calculated using inputs from a separate workforce module where employee specific revenue and costs are planned and automatically fed into the project planning module. Once the steps above have been completed for a project, the PSR account hierarchy view can be immediately run as a report, giving planners insight to the profitability of their contracts. With each pool’s burden cost broken out, planners can understand the total cost incurred on a contract, and if necessary, go back and make adjustments to their plan. The PSR can even be setup to run at a total contract or vehicle level, and/or with the ability to compare the working AOP to the various what-if modeling scenarios that we referenced earlier. Systematically replicating the Excel models and ancillary processes your organization currently utilizes may seem daunting. Hopefully the themes we highlighted above paint a clear picture of how PBCS can be used to streamline the AOP, properly burden direct costs, and view accurate project profitability. By focusing on using as much dynamic content as possible with a cloud-based solution like PBCS, such as the project attribute assignments we noted, we have been able to successfully deliver this functionality to government contracting organizations of all sizes and complexities, quicker than ever before. Stay tuned, as we plan to cover in an upcoming blog how the build-up of more granular items that feed the P&L (e.g. direct/indirect labor) can be efficiently configured within PBCS. If you are interested in using an application like PBCS for completely dynamic indirect rate modeling (assigning cost pools and performing cost allocations), be sure to check out our webinar on that topic.